If an ounce of prevention is worth a pound of cure, what are unnecessary heart procedures worth? Major news outlets have been reporting on one of the bleakest chapters in the history of Western medicine: Doctors and hospitals that put big profits above the best interests of their patients! Not surprising when you understand our medical system rewards doctors based on volume of procedures rather than quality of care! Instead of putting BLIND faith in doctors, discover alternative therapies that can save your heart in my FREE e-Book. Please send Dr. Cutler’s FREE Cardio E-Book to my email address below! You will also receive a free subscription to Dr. Cutler's Easy Health Options® e-newsletter. You may opt-out at any time and your privacy is assured. According to a study in Circulation, the journal of the American Heart Association, 59% of these invasive procedures were inappropriate. That means stable patients went under the knife when they could have achieved the same or better outcome with treatment instead of surgery! The bypass-in-a-pill—that sweeps dangerous plaque from your arteries without surgery! How to make yourself 500 percent LESS likely to have a heart attack! The 25 cent vitamin that thins your blood and protects you from a deadly clot! Meet the Author... Michael Cutler, M.D. 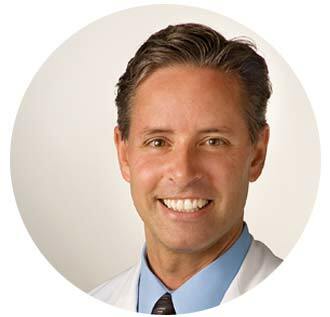 After graduating from Tulane Medical School, Dr. Cutler pioneered nutritional medicine—developing natural health remedies and safe alternatives from the cutting edge of science. He practiced integrative medicine at the Modern Health Clinic for Advanced Medicine, and founded the Total Health Institute Medical Clinic. Dr. Cutler is also the editor of Easy Health Options®—dedicated to bringing you the most effective natural health solutions on the web today. For the past 20 years, the heart industry has made high cholesterol the "demon" behind heart attacks and strokes. But the truth is nearly HALF of all heart attack victims have completely normal cholesterol. And they never tell you that cholesterol is a vitally important substance which is needed to build our cells' membranes and produce several key hormones. But these medicines not only miss the mark, they also sabotage your body's natural ability to keep your heart healthy. One of the most popularly prescribed medicines for lowering cholesterol actually inhibits production of an important heart-saving nutrient naturally produced in the body! 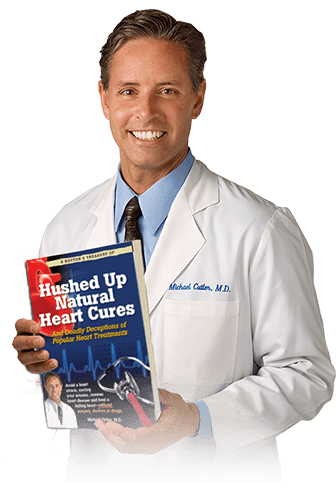 In your FREE copy of my exclusive e-book, Hushed Up Natural Heart Cures And Deadly Deceptions of Popular Heart Treatments, you'll learn about safe natural alternatives that work with your body to keep your blood flowing and your heart going strong—without harmful side effects! The American Heart Association lists 10 contributing factors for the development of heart disease. Six of those are completely under your control. With guidance, it’s completely possible to prevent, reverse or eliminate heart disease and heart attack risk—no matter your family history! Healthy lifestyle habits, like a heart-healthy diet and daily exercise are important, but research also shows that heart patients are four times less likely to die of heart disease if they are taught stress reduction techniques. Yet most people suffering from heart problems don’t get this information in their doctors’ office. But in my FREE exclusive e-book, Hushed Up Natural Heart Cures And Deadly Deceptions of Popular Heart Treatments, you’ll discover a well-rounded approach to handling heart problems including alternative therapies and preventative measures your doctor won’t tell you about. Most people are deceived by overpriced popular treatments that don't work, are unnecessary or can be dangerous and even deadly. Recent headlines prove it! All over the country doctors and hospitals are performing thousands of unnecessary cardiac catheterizations and stent surgeries—even fabricating medical reports to make the procedures seem necessary! In fact, The Washington Post reported that former President George W. Bush's recent stent surgery was likely UNNECESSARY. Why does this happen? Cardiac care is a lucrative business! These surgeries cost thousands of dollars. And with government payouts from Medicare as much as $10,000 per procedure, and Medicaid about to expand under Obamacare—the sky's the limit on how much greedy surgeons can pocket. 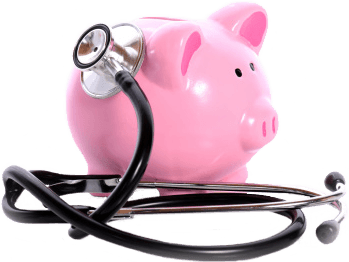 There are scores of effective natural cures and remedies for heart disease and heart problems that are being suppressed for one reason: because they're so affordable and would put the medical establishment out of business! You'll read about them all in your FREE copy of my exclusive e-book, Hushed Up Natural Heart Cures And Deadly Deceptions of Popular Heart Treatments! Did you know the Chinese rarely have heart attacks? Their secret can lower your cholesterol by 76 points without drugs or supplements! 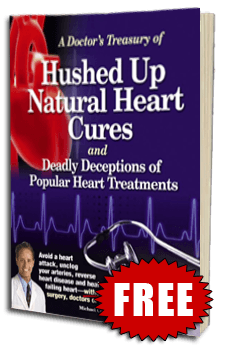 Read about it and other heart-saving alternatives on page 16 of Hushed-Up Natural Heart Cures and Deadly Deceptions of Popular Heart Treatments. Get Your FREE Copy Now! Recent studies show 600,000 bypass surgeries are performed every year and 85 percent are done on patients who don't meet the criteria! That's because doctors only inform their patients of an option other than surgery in 6 percent of cases! And then it's only patented prescription medicine with unpleasant—even harmful—side effects. But you're not doomed to a deadly diagnosis! There are safer ways to avoid heart problems including little-known natural remedies that most doctors won't tell you about—like the extraordinary anti-oxidant that acts as a tiny power plant for every cell in your body, especially your heart! You'll find this secret and lots more in your FREE copy of my exclusive e-book, Hushed Up Natural Heart Cures And Deadly Deceptions of Popular Heart Treatments!